A couple days ago I snapped some photos and a video short in Chautauqua Park, Valley City, North Dakota. 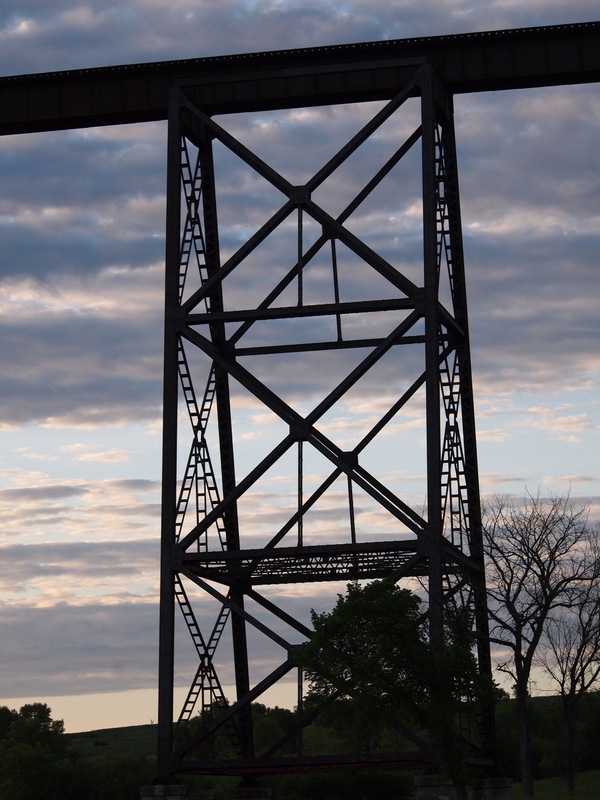 While looking at the High Line railroad bridge (built in the first decade of the 20th century), I was kind of thinking about how elder Euro-American frontiersmen (or frontierspeople? — what the heck is the non-gender form of frontiersmen?) might have been thinking about this and railroads around the turn of the 19th century, especially as younger industrial laborers swarmed into the area. The idea of history is to understand understanding, or understand how others understood their world. To apply my historical sense of place, a frontiersman, along with Natives in the area, would have looked at this industrial expanse of railroad as something out of place; or as a way to populate the Great Plains and American West with non-Natives; or as a new industrial icon supplanting a time and place that had passed (Fred Turner rambled on about this at great length in Chicago in 1893). A historic photo of the construction of the High Line. Photo from Digital Horizon’s, NDSU Institute for Regional Studies. If you overnight, and it’s a pleasant enough evening to have the windows open (or even closed), you’ll be woken up by the thumping cha-chunk, cha-chunk of today’s diesel locomotives playing the Hi-Line bridge like an instrument. I find the noise soothing. 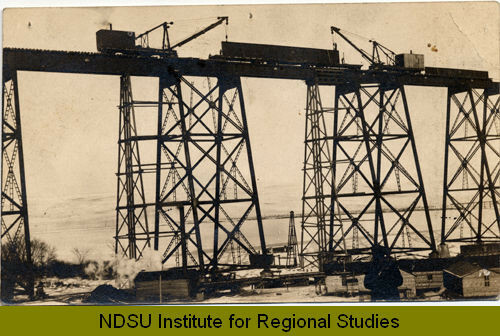 Here is the link to the historic High Line photo from NDSU’s Institute for Regional Studies. The video short and another photo below. A detail of the High Line substructure. 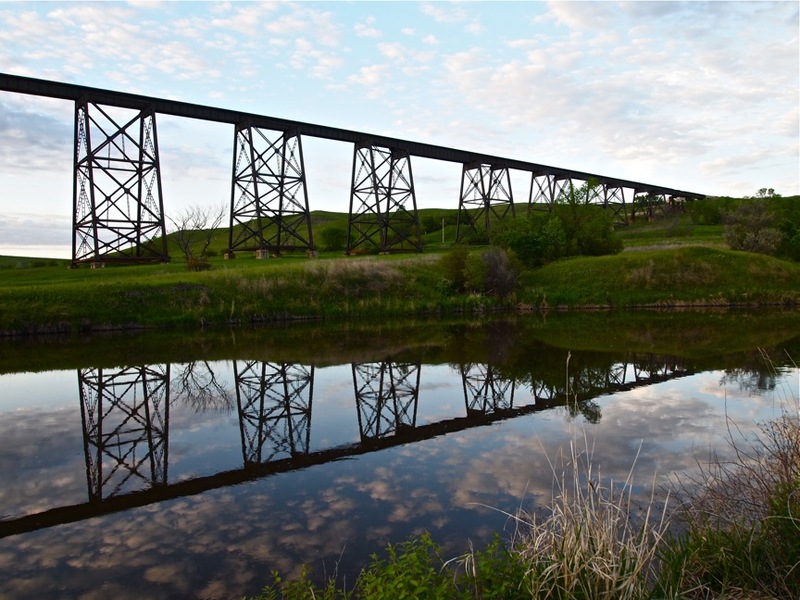 This entry was posted on Thursday, June 13th, 2013 at 8:26 am	and tagged with Industry, Labor History, North Dakota, Railroads, Valley City and posted in Uncategorized. You can follow any responses to this entry through the RSS 2.0 feed.